No Mexican panaderia for hundreds of miles? 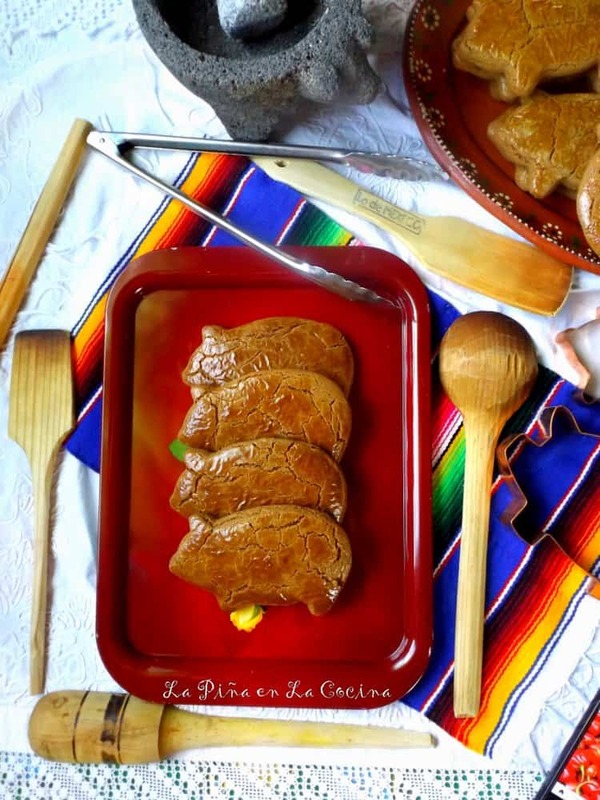 Bake my own marranitos-puerquitos! Reliving my favorite childhood moments with this recipe. In a large bowl, beat shortening with an electric mixer on medium to high speed for 30 seconds. Add the brown sugar, ginger, baking soda, cinnamon, orange zest, salt, ground cloves and anise. Beat until combined, scraping bowl occasionally. Beat in the eggs and molasses until combined. Beat in as much flour as you can with the mixer. Using a wooden spoon, stir in any remaining flour. Divide dough in half. Cover with plastic wrap and chill for at least 2 hours. Preheat oven to 375 degrees F. Line a cookie sheet with parchment paper, set aside. On a lightly floured surface, roll out half of the dough at a time to about 1/4 inch thick. Cut out shapes with a lightly floured 4 to 5 inch pig shape cookie cutter. Place cutouts 2 inches apart on cookie sheet. Whisk the third egg with a little water and brush the tops of unbaked marranitos. Bake in preheated oven for 11 to 13 minutes or until edges are light brown. Cool on cookie sheet for 2 minutes. Transfer to wire rack, let cool. To store, layer cookies between wax paper in an airtight storage container. Store at room temperature for up to 3 days or freeze for 2 months. Tips~ The panaderia marranitos do not contain ginger, but I really love the flavor it adds. This will be up to you if you want to add it or not. Do not skip the step of chilling the dough. You can even prepare the dough a few days ahead and keep it chilled until you are ready to use it. The cookie cutter comes in a few sizes online. Resist purchasing the larger one, unless you want one giant marranito that can feed 4 people! Don’t roll your dough out too thin. Don’t crowd you baking pan. Five marranitos per large baking pan. The crackled look is just what you want for a more authentic looking cookie. Do you remember the big red trays and tongs when you enter the big panaderias? It’s like they are daring you to fill every space on that tray! When do you apply the egg wash? Hi! Sorry about that. I forgot to add that to the directions. I added it in now. Thanks for pointing that out to me. You brush them with egg wash before baking them. My favorite with cup of hot coffee!. Now I have a recipe, thank you. AND I love that rolling pin. What kind is it? Is it easy to find. Thank you Sherrill. The rolling pin was made by a local craftsmen. But if you go online to the Texas Rolling Pin site, I believe they have similar ones. I am sorry Ale, I am just checking my emails on my blog at 9:44 p.m. Not sure why the dough would be dry. The dough is thick. Was is crumbly dry? I would suggest kneading it on a flat surface before chilling it. You could mix in a little bit more shortening, but you really don’t want the dough to be too soft. If you message me on my Facebook page, I will get the questions faster. Sorry it took so long. My abuelo worked in a panderia and would bring some kind of Mexican bread home to us every day. This was 70 yrs. ago, when I was just 4 yrs. old. One of my few memories of him. That is such a wonderful memory of your abuelo Jennie. These look wonderful! I grew up in North Texas and my granddad would always have a paper bag filled with marranitos when we could come to visit. It was our little tradition. The orange zest sounds like a tasty addition. I will have to try out your recipe soon. Jenny, that is such a wonderful memory. I could almost see your granddad standing there with his paper bags of marranitos. So heartwarming!! How much Anise do you use? I don’t see that on your ingredients list but it’s in step one. Hi Ashley, the amount was there, but next to the cloves, not below it. I fixed it. Thank you for bringing it to my attention. Thank you so much! I’ve looked everywhere for traditional marranitos cookies and I think this is going to be the one! !